Now, I’ve always heard that making fudge was really hard to do. In fact, the only type of fudge I ever make successfully is the “cheater” chocolate fudge that uses sweetened condensed milk and the microwave. 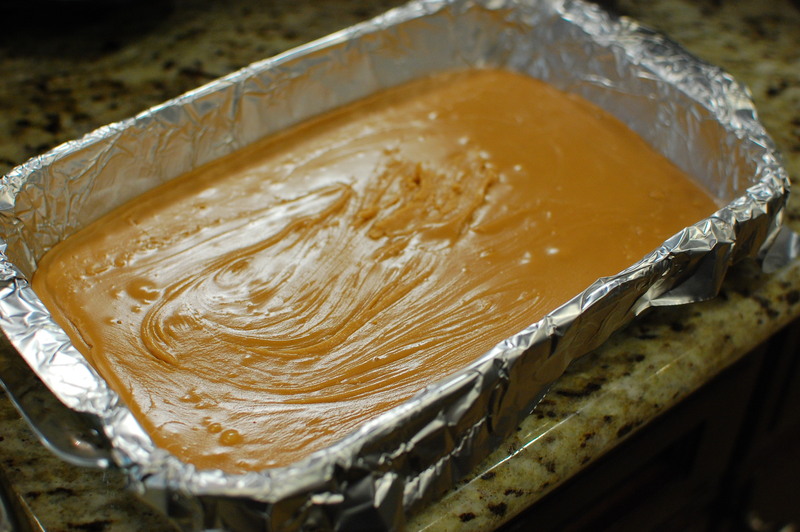 (There was this one time I tried to make pumpkin fudge – and it was a disaster! I didn’t end up with fudge, but instead made a crumbly mess. It was ok in the end, since I used the failed fudge as an awesome filling for pumpkin cinnamon rolls!) Thankfully, this recipe has never given me any problems – even with substitutions. Half the time, I don’t even bother with the candy thermometer! 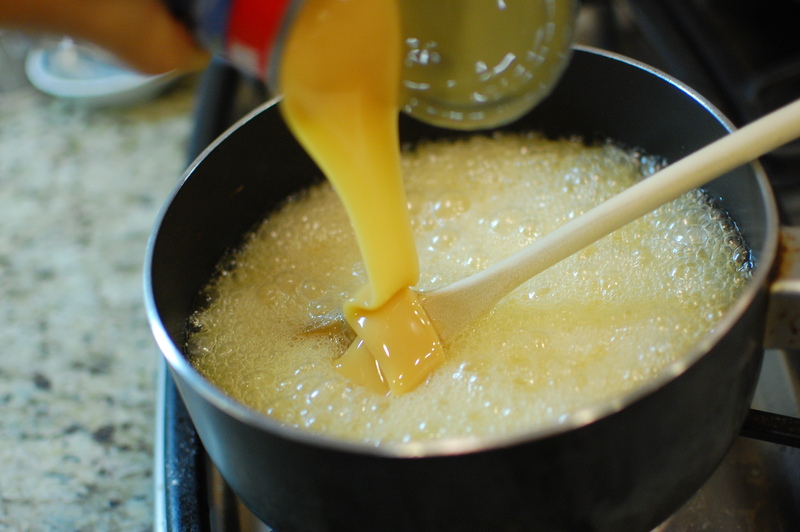 One of the ingredients in South African fudge is Golden Syrup. 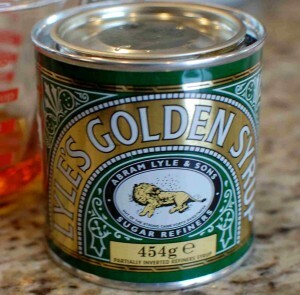 For the first couple of years I made this recipe, I didn’t really know what “golden syrup” was. I had never heard of it, and I had never seen it. I figured it was some sort of sugary syrup, and brownish or ‘golden’ in color. (Haha wasn’t that sooo smart of me???) That’s it. So in its place, I have used: honey, dark corn syrup, maple syrup… you name it. The recipe has always been fine, no matter what kind of syrup I used. Last year though, I discovered a German supermarket in town – and they carried all sorts of European grocery items. When browsing through the different flavors of Austrian jam… I saw a can on the next shelf that said “Golden Syrup”… and I bought it. Since then, I’ve used Golden Syrup in the recipe instead of whatever random syrup I had on hand, and I’ll admit… I think it’s a little better with it… but it’s not 100% essential. So use what you have, unless you have a supply of Golden Syrup. 1. In a heavy pot (I used a pan that was too small in these photos – try something a little bit bigger, like a dutch oven), dissolve the sugar into the water over medium-low heat. 2. 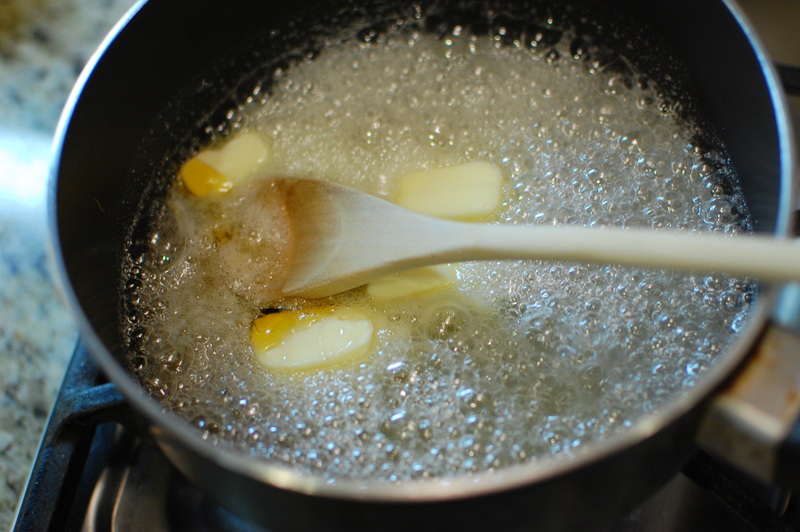 Add the butter and golden syrup, and stir with a wooden spoon until the butter is melted. 3. 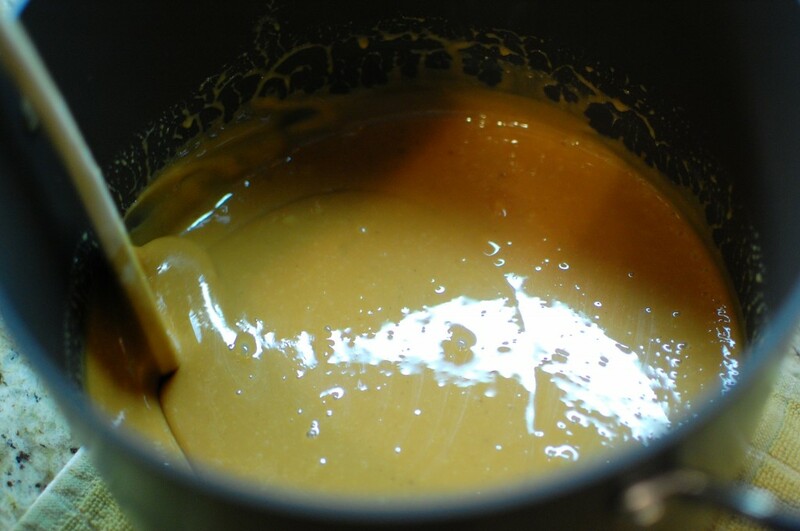 Add the salt and the sweetened condensed milk, and bring to a boil. 5. 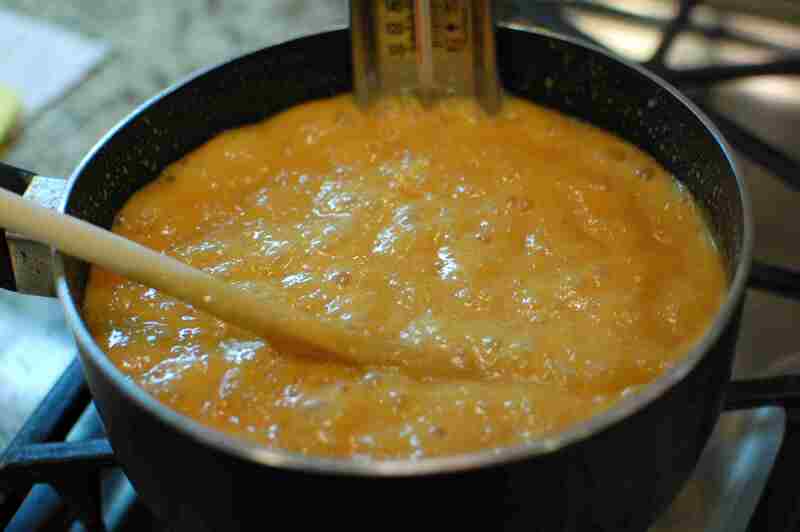 When the mixture becomes thick and reaches the “soft ball” stage (235-240 degrees F), turn off the heat. (You can use a candy thermometer to judge when you are at the soft ball stage, or you can also drop a small amount of the mixture into a cup of cold water. If the mixture firms up so that you can form a soft ball of candy between your fingers, then you are done. If you are using a candy thermometer, I would stop cooking somewhere around 237 or 238 degrees… if you go all the way to 240, you might end up overcooking.) Another way to tell if your mixture is cooked to the right stage, is to look for the mixture to “sheet” off the back of your wooden spoon. 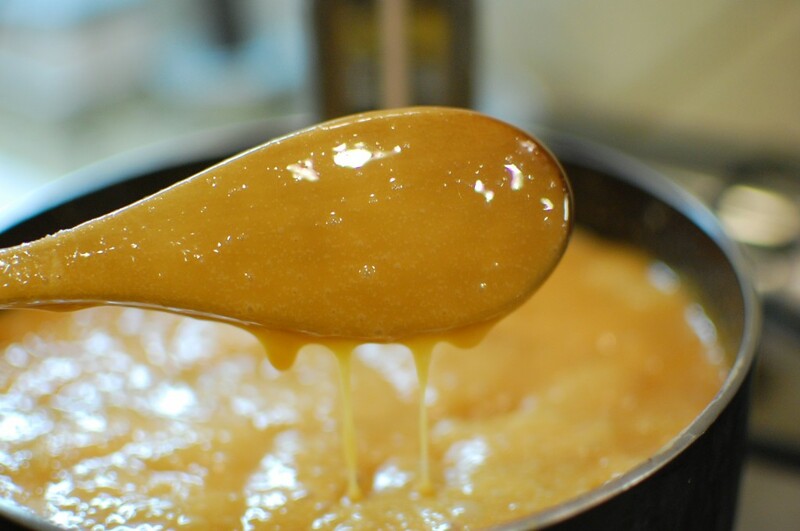 If you dip the spoon into the mixture and pull it out above the pot, look for the syrup to slowly drip off the back of the spoon – it may start off as individual drips, but they will coalesce into a single sheet of syrup coming off the spoon. 6. Remove the pot from the heat, and add the vanilla extract (stirring as you go). THIS STEP IS THE MOST IMPORTANT! Keep stirring the mixture with a wooden spoon – actually, you want to stir vigorously or beat the mixture – for about 3-5 minutes until it becomes thickened. 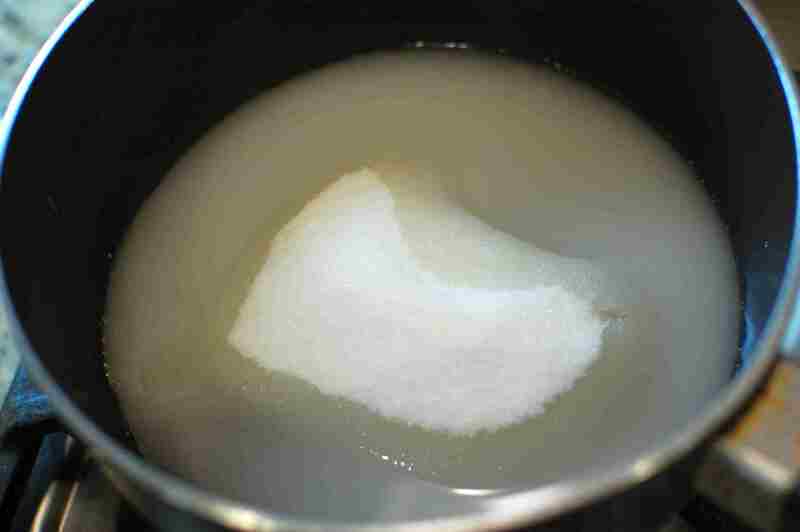 You will notice the mixture beginning to crystallize and form a paste on the sides and corners of the pot – the syrup will start looking a little chalky. At this point you can stop. 8. Allow the fudge to rest on the counter for 2-3 hours until firm. Remove to a cutting board (use the foil as a sling to remove it from the pan), and cut into squares. Store in an airtight plastic container. There is quite a bit of sugar in this recipe… so it is quite sweet, as most fudges are. It tastes a bit like caramel or dulce de leche. It also has a… powdery or chalky quality that kind of melts in your mouth. 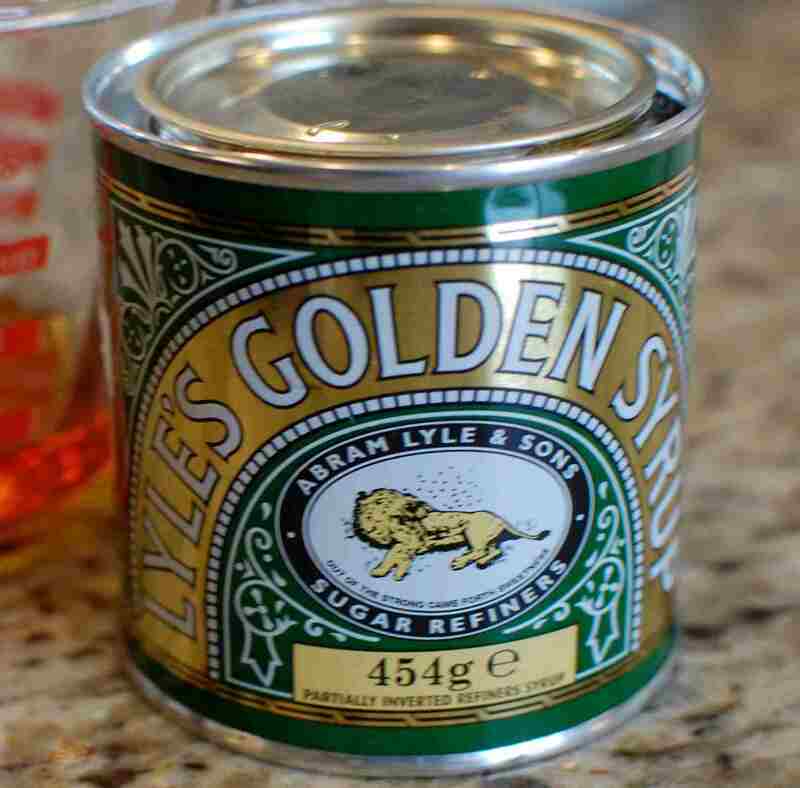 Yes, I have recently seen Golden syrup at Cost Plus World Market… great tip! I’ll cook it for my boyfriend tomorrow! hi..what happened if i reduce the amount of sugar? will it still turn out to become fudge? Hi there. I would be careful not to play around with the ratio of ingredients in any fudge recipe – it will likely make the fudge fail and not set up properly. Sugar is one of the most important ingredients in fudge – not just for sweetness, but also for structure. Thank-you so much for posting this recipe. I have been scouring the internet for a decent South African fudge recipe. I just can’t seem to get excited about American fudge even after 20 years . My daughter and I were super excited to try this recipe and we were simply in heaven! Butter, sugar, condensed milk you really can’t go wrong however this particular combination and method results in a fudge with the perfect texture. This is what I grew up. Not only that, instructions were great and photos were brilliant. Thank-you very much. 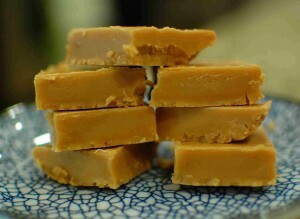 I have made fudge using this recipe with ‘Light corn syrup’, ‘honey’ and ‘Golden syrup’. Interestingly the honey and golden syrup had a very similar taste however, even though I grew up in SA and on Golden syrup and honey, I preferred the fudge made with ‘light corn syrup’. It was a little less sweet and the syrup taste didn’t take over too much. We do omit the vanilla. 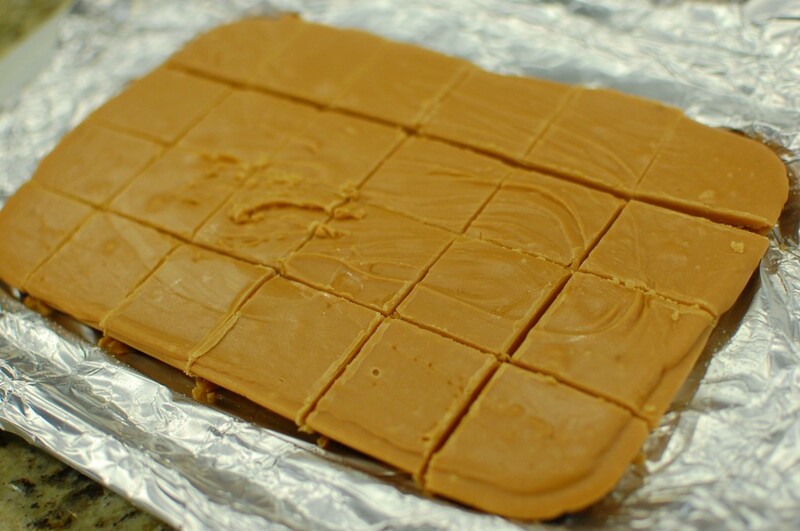 This is still by far our favourite fudge recipe. Thanks again. Glad you liked it! Thanks for the feedback! This recipe was great. My friend has been craving fudge and I thought I’d make it as a Christmas gift. I tried another recipe which completely failed so I searched again and found your one. Thank you for saving the day, it came out perfectly. yay! Glad to hear it worked out for you! Have you tried to double the mixture and if so how successful was it? The recipe sounds wonderful and I look forward to trying it. Hi Tracey, No – I’ve never doubled the recipe and would be a little bit worried to do it. Sometimes fudge (like jam) can be a bit tricky, and doubling the ingredients can sometimes alter the cooking time and temperature – and the recipe can fail as a result. I think it would be better just to make two separate batches instead. Did you do anything wrong? Probably. Sounds like you burned it… how hot was your stove turned up? It needs to be medium-low, not full blast. How big was your pot? If you used a too-big pot, or something with a very wide bottom, you might have had too much surface area. Love this recipe Mika! Thank you – if you follow this you cannot go wrong. Thermometer is key I recon. I tried this today. And it was so extremely sweet. Not like American fudge, to me this is sweeter. But I don’t have much of a liking for chocolate. This is good but too sweet for me to try and make a whole batch. There is no chocolate in this recipe… so I’m not sure what you mean when you say you don’t like chocolate when critiquing the recipe? As far as the recipe goes, this is fudge, which is a type of candy. If you don’t like sweet stuff… then I guess candies like fudge are probably not for you! Hi Mika! I was just wondering, how many people does this recipe serve? It sounds delicious and I was just going to make it as a treat for the kids in my class and there are thirty. Thank you! It makes 24 squares (how I cut it), so I would say anywhere between 12 – 24 servings. But you could cut them smaller, just do 5 rows, and cut the rows into 6 pieces, so that will give you 30 slightly smaller squares. Turned out great! Thanks for the very detailed directions. Hi i was wondering what the measurements were when referring to 5T or 2T etc? Hi! This is my FAVOURITE sweet of all time! Just wondering if I can use caster sugar instead of regular sugar ? I’m not sure… I’ve never tried it that way. I normally use regular granulated sugar. You could try it and see if it works? I just made this tonight, aaah the flavours there but it didnt set properly!! What did I do wrong? Did I take it off the heat to early? Or did I not mix it with the vanilla long enough? I followed all the steps but came out like soft toffee. I’m not sure? After you add the vanilla, you want to keep stirring until the mixture starts looking chalky. If you stop stirring too soon, you end up with more of a soft chewy caramel (which is still good… but not fudge!). Hi. I did de recipe but without de vanilla. The mixture is not getting hard, even with one night in the fridge. It’s more like a chewy texture. Is vaniila so important for the nice texture of rhe south african fudge of maybe someting else I did wrong? Can I reheat this mixture and try to recuperate it? You need to add the vanilla. Without the vanilla, you will end up with a soft chewy caramel. It will taste good (and you can cut and wrap in waxed paper for homemade caramel chews), but it won’t be a fudge! This recipe used to come on the condensed milk tins! Was a staple in many Cape Town homes! Still today, you will find These on shop counters. Thank you for the recipe and the photos! About to start a batch myself! I have made this recipe about 4 times. Follow the instructions 100% and yet my fudge is not getting hard. It’s that soft chewy texture. I even resorted to a hand held beater to make sure I beat well enough after I remove the mixture from the heat. I used a candy thermometer too. I’m just not sure what’s the reason it’s not hardening like it should. Did you add the **vanilla extract** and then stir (as described in step 6)? The only time this recipe is failed me, I forgot to add the vanilla and I ended up with chewy caramel instead. I made this tonight with my kids, they helped me stir.. just a small portion of the outsides of the bowl were like toffee but the rest came out perfect!!! Anyone who does not like sweet stuff and makes this recipe one has to ask what about sugar and syrup did you think would not be sweet? I miss South African fudge and would love to try this recipe☺️ Can I substitute golden syrup with maple syrup do you think? Yes you can – I’ve done it before. It does add a bit of a maple flavor to it though. Thank you for this well explained recipe! My husband was craving this fudge, he’s drone South Africa, and he loved it. My in-laws too! They just said it was a tad sweet but she said that when she use to make it in Africa they would put a couple drops of lemon after you add the Vanilla to cut the sweetness a bit. Going to try that on my next batch. I have made it twice now, but I accidentally forgot to stir it for 3 minutes after I pour the vanilla extract in. I mixed the vanilla extract with the mixture, but didn’t stir for 3 minutes. What effect will that have on my fudge? Hopefully not? I once forgot the vanilla entirely and stirred and stirred… and ended up with a tasty caramel that I cut into soft chews and wrapped as candy. So if it failed, you can still salvage the “fudge” and call it “caramel”. Hi .the water and sugar ratio does not look right. I double checked the recipe and it looks correct to me.